5:00 P.M. until 7:00 P.M. The San Francisco Support Committee for the unconditional release of Puerto Rican political prisoner Oscar López Rivera, calls all political, civic, religious, labor unions and the community in general to join us to demand his freedom. Oscar López Rivera has spent thirty four years of his life imprisoned due to his unbending commitment for the independence and self-determination of our Puerto Rican nation. Petitions from all over the globe supporting his unconditional release have been sent to the President of the United States from Nobel Prize Laureates such as Arch Bishop Desmond Tutu from South Africa, and Carlos Esquivel from Argentina to name a few. The current Governor of Puerto Rico, Alejandro Garcia Padilla, as well as countless Puerto Rican artists and celebrities, and U.S. Congressional representatives, such as Luis Gutiérrez, José Serrano and Nydia Velázquez, have also made their voices heard in support of his immediate and unconditional release. We’re standing together on November 10 to say, “We need a raise!” People across the country will be standing up with fast-food workers and all 64 million underpaid workers making less than $15, because it’s time for $15 for all workers. Together we’re turning the tide in favor of working people and our families. And we’ll need everyone’s help — including yours — to make this a reality. We’ll call on corporate CEO’s to raise pay and respect our right to form unions without retaliation. Andf we’ll call on our elected representatives to stop letting the wealthy and powerful write the rules in their favor. Together we can work to end racism and oppression, create a path to citizenship for immigrants, and fight for wages that strengthen our communities. POISONING OF THE EAST BAY HILLS! UC Berkeley, the East Bay Regional Park District, the City of Oakland, and others, with funding from FEMA and other public moneys, plan to kill over 450,000 healthy trees in the East Bay hills, some over a hundred years old, on over 2,000 acres of public lands from Point Richmond to Castro Valley. The destruction has already started, and is expected to escalate as early as August, the end of the official nesting season, unless we stop it. Millions of animals will die from the loss of homes and food and the devastation left by bulldozers, chainsaws, and poison, and the air quality and climate in the Bay Area will suffer. Large amounts of herbicides are planned to be applied over a 10-year period, including Roundup (glyphosate, Monsanto), Garlon (triclopyr, Dow), and Stalker (imazapyr, BASF). These pesticides have been shown to cause serious health problems in both humans and animals, as well as complex negative ecological impacts on forest organisms. They persist in the soil, and have found their way into watersheds and ground water. Roundup has been banned in many countries because of its toxicity, and the World Health Organization recently classified glyphosate as a 2A probable carcinogen. The poison would affect everyone who uses the parks, and wash into the bay from the creeks. Do we need more cancer and chronic illness? When asked for public comment about one of the most important parts of cities — our parks and open space — of the 13,000 people who responded, 90% opposed the plans. Since then, over 65,000 have signed a petition demanding the projects be stopped. Why is the will of the people being ignored? Under the guise of fire safety, the agencies involved plan to kill moisture-rich forests that precipitate over 10 inches of water from fog drip in the midst of drought. According to FEMA, the goal is to transform much of the East Bay parks landscape into “grassland with islands of shrubs”, but this will increase fire danger by creating a highly flammable environment where fires can spread quickly, driven by winds unimpeded by tall trees. Our once beautiful parks will be barren and desolate, and when the rains start, the landslides will come. Eucalyptus are the preferred nesting site for eagles, hawks, and large owls, and preferred resting site for migrating Monarch butterflies. They also feed hummingbirds, bees, and other pollinators. Monterey pines create incredible animal and plant diversity. A survey of 173 ornithologists reported that 47% of birds eat from non-native plants. Return Anti-Fascist Teacher Yvette Felarca to Her Classroom! Stop Interrogations and Harassment of Students! Anti-fascist activist and teacher Yvette Felarca continues to be prevented from returning to her classroom at Martin Luther King Jr Middle School after being placed on administrative leave. After she helped stop a neo-Nazi recruitment rally in Sacramento this summer, and was stabbed in the process, terror threats were made against Ms. Felarca and the school if she’s not fired, and instead of defending the entire community, including Ms. Felarca, the school district is capitulating to the neo-Nazis’ demands by removing her from her job. The school district also took some of her wages back out of her bank account. Both current and former students continue to be pulled out of class and interrogated about her, now with parental notification, but the nature of the ‘interviews’ are being misrepresented. Non-sectarian defense of all anti-fascists! 6 pm in front of City Hall (835 East 14th St.) to tell our stories. Bring signs, and since they have not been listening, bring pots to make some joyful noise! Let’s remind them we’re people, families, we have beloved pets, we have neighbors who are too ill to be able to join us, and others who would become homeless if this is not stopped. We own our homes; yet, we are held ransom to a group of corporate investors that sees us only as a means to their quick wealth. Not only have the new owners made dramatic rent hikes, but our home values have dropped overnight $10,000 for each $100 raise in rent/fees, according to the Golden State Manufactured Owners League. The greed we’re seeing here, of over 30% hikes in rent and fees, has to be stopped but no City, County, State, or Federal politician has agreed to help. Not one. Our City Council Member Deborah Cox has NEVER responded since a first letter 7/25. To top it off, since a month ago we’re having sewer backups and overflows on the West side of the park because of the owners not paying to have the needed work to clean out the pipes correctly. Then, when a water pipe burst 1-1/2 weeks after we got the rent hike letter, the pipe was not replaced; only a band-aid job was done. WE DESERVE BETTER! Please help get the word out. And if you come fragrance-free you’ll be helping to make this event more accessible to more people. Thank you! Bring your lab coats! Bring your rally signs! We gather together to defend our planet and our institutions through civic engagement and sustained political action at local, state, and federal levels. Please note: This event is in the evening, so it will be possible to support both this march and other marches for science in San Francisco or Sacramento, or to participate in UC Berkeley’s Cal Day. We support ALL efforts to promote Earth rights and science literacy on this important day, and we want all to have the opportunity to fully participate! The Bay Area refuses to accept the final verdict for the officer who shot and killed our son, Philando Castile, on July 6, 2016. Join us to voice our intolerance for this injustice on Saturday June 17th. The Bay Area refuses to accept the final verdict made by the jury members in Minnesota this past week. The officer who shot and killed Philando Castile, while his wife and daughter were present, IS GUILTY. There is no debate, and there is no justification for murdering an innocent man. 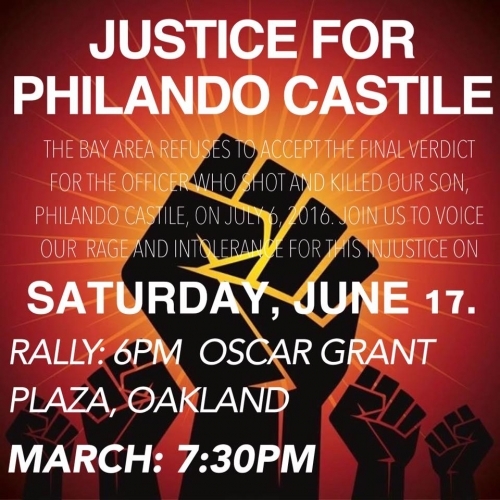 Oakland wishes to stand in solidarity with Philando’s family, and we wish to voice our intolerance for police terror NOW. There is no time to wait–the system has and continues to fail black folks in Amerikkka. Bring signs, drums, any materials to make your voice heard. THE BAY AREA STANDS WITH PHILANDO CASTILE AND HIS FAMILY. WE WILL FIGHT AND DEMAND JUSTICE FOR BLACK LIVES. Come stand with the mothers of murdered children and family members this and every Friday to pressure District Atty George Gascon to charge killer SFPD cops with murder who executed Mario Woods, Jessica Nelson, Luis Gongora Pat, Alex Nieto, and all the rest. Bring signs! STOP POLICE MURDER! We have signs that say “Mario Woods is our Son”, and signs for each one murdered. Please find the box of signs and “Say Their Names” for the Media. July 11 we head to city hall and demand land so we can create villages. We created an effective, immediate, humane and dignified solution that addressed the housing and homeless state of emergency. we cant wait for the city’s slow, money driven bureaucratic process. folks need homes and services NOW! not 5 years from now. the monies and programs the city is FINALLY putting towards low income and no income housing won’t house folks immediately. but #TheVillage can house folks NOW until the city has secured permanent #HomesForAll. There are 6,000 folks without homes in oakland. that number will continue to grow unless the city acts like we are in a state of emergency and allows the community to enact our creative and effective solution. Our displaced residents on the streets want land to build a village for folks in recovery. we want land for a harm reduction village. we want land for a village for families with children and homeless youth. we want land for a lgbtq village. we want land for a village of elders. we want land for a village for women. THE TRUMP/PENCE REGIME MUST GO! In the Name of Humanity, We REFUSE to Accept a Fascist America! Only the people acting together in the streets and public square can force this demand before the world. Should we fail to do so, the future and values we aspire to could be brutally cut short by the actions of the Trump/Pence regime. July 15th must be a day when every person, every group –religious, community, service, political organization – all who feel the tremendous threat to humanity posed by the Trump/Pence regime – stand together showing the world that people here are determined that this regime must go …not in two years or four, but now. Contact Refuse Fascism to volunteer or to make your organization a partner or co-sponsor of July 15th. Hours after President Donald Trump’s call to ban transgender people from the military made national headlines, San Francisco resident Rachel Rognerud, 28, created a call to action that is gaining steam. The protest is set for 6 p.m. at Harvey Milk Plaza, at Market and Castro streets, and already more than 1,000 people have pledged to attend.